Donna Tartt's The Secret History meets Pretty Little Liars in this propulsive, edge-of-your-seat novel that explores just how far the elite at an English boarding school will go to maintain the social order. This title will be released on January 30, 2018. About the Author: M. A. Bennett is half Venetian and was born in Manchester, England, and raised in the Yorkshire Dales. She is a history graduate of Oxford University and the University of Venice, where she specialized in the study of Shakespeare's plays as a historical source. After university she studied art and has since worked as an illustrator, an actress, and a film reviewer. She also designed tour visuals for rock bands, including U2 and the Rolling Stones. She was married on the Grand Canal in Venice and lives in north London with her husband, son, and daughter. Follow her at @MABennettAuthor on Twitter and at m.a.bennettauthor on Instagram. Noteworthy experiences while reading this book: This one was full of Young Adult tropes that we have seen again and again. Check out author's other books or related books? Maybe, it would depend on wither or not the story was something new. Recommend this book? 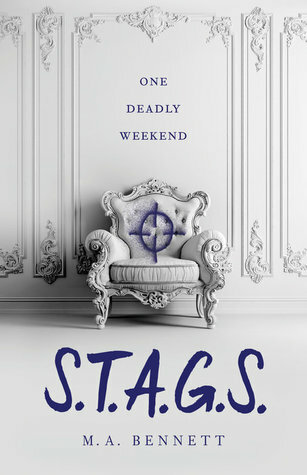 If you like Young Adult tropes and a thriller with not a lot of thrill check this one out. Notes and Opinions: I am sad to say that this is one of those books with an amazing cover but a story that falls short of expectations. It had the same story we have heard before. Poor gets scholarship at an amazing school only to find out that not is all as it appears to be. This one says its a thriller but its more of a contemporary with a light thriller feel. The characters were great but the story just fell very flat for me. The setting was the same old same old. It didn't really have a unique feel to it at all and I really wished that this book would have. I wanted to love it so much. Go Into This One Knowing: Young Adult tropes we have seen over and over and over as well as little thrill in this thriller.